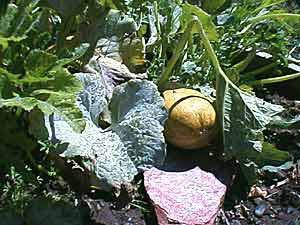 This fungus disease occurs all over the North America and infects a wide variety of plants, including beans, cucurbits, lettuce, and peas. A powdery white growth covers the upper surface of leaves, which eventually turn yellow and dry. Older leaves are usually infected first. The fungus competes with the plant for nutrients, reducing yields and weakening or even possibly killing it if infection is severe. Fruits and pods may also be covered with mildew. This disease usually develops late in the season on mature plants and thrives in both dry and humid weather. It can spread rapidly. Plant resistant varieties where available. Potassium bicarbonate fungicides are effective when applied according to label directions.